As organizations look to embrace the benefits of cloud collaboration, defining the sensitivity of information is critical. The combination of TITUS Classification and Netskope’s cloud access security broker (CASB) solutions enables enterprises to embrace the cloud while ensuring sensitive information is protected. The December 31, 2017 deadline for protecting Controlled Unclassified Information (CUI) and complying with the NIST Special Publication 800-171 standard is fast approaching. Join PKH Enterprises and TITUS for a discussion on strategies to help federal agencies and contractors meet the main CUI requirements as established by NIST 800-171 and DFARS 252.204-7012. These experts will provide an analysis of the most challenging compliance areas, and offer insights to help organizations prioritize their next steps. This webcast will help privacy and security professionals answer these questions, and guide them through the key milestones they must achieve to meet the May 2018 deadline for GDPR compliance. Discover how TITUS Classification Suite and Netskope work together to prevent data loss and enhance cloud data security with Box, Gmail, and OneDrive. To address insider security threats, many organizations deploy data loss prevention (DLP) solutions. Often, the scope of the process and policies are overwhelming to accommodate every scenario. Administrators quickly find it impossible to accurately identify every type of sensitive document, as well as predict the behavior of every type of user. As a result, some businesses deploy their DLP systems in “watch-mode”, where they monitor for behavior, but don’t realize the true benefits of actually preventing data loss. Join guest speaker John Kindervag, VP and Principal Analyst at Forrester Research, Inc., and Stephane Charbonneau, CTO at TITUS, where we will discuss the top four recommendations for a successful data security strategy. The volume of sensitive data spanning healthcare organizations is large and growing at an increasing rate. This is a fast paced environment where patient data (PHI, PII) and intellectual property (IP) can easily be sent to unauthorized recipients, putting this sensitive information at risk. Join John Ford, CEO of Sienna Group, former Chief Privacy Officer at WellCare Health Plans, and TITUS for an upcoming webinar where we will discuss the specific challenges facing healthcare organizations today, and why data classification is the foundation in helping them achieve information protection. Explosion of unstructured data and de-perimeterization now makes it easier for sensitive data to be shared across the organization – at any time, in any place, from any mobile device. Some unstructured data is sensitive (PII, IP, ITAR) andmust be handled more carefully due to legal restrictions, and to prevent the risk of loss or exposure. Learn how Provident Bank involves their end-users in data classification for protecting their valuable information. Successful digital transformation requires organizations to keep up with an unprecedented pace of change. There is an ever increasing need and ability to share information - but this also brings new risks and challenges. Join Forrester Research and TITUS in this On Demand Webinar as they discuss strategies and solutions to help your organization embed positive information security behaviors in your employees, helping reduce the risk of information loss while simultaneously growing your business. Listen to Forrester and TITUS to learn how you can sharpen your security edge by implementing tools to identify sensitive information, developing policies that protect data, and running reports that help recognize and prevent internal threats. Today, 80% of data is unstructured, and it’s doubling every two years . Your organization’s unstructured information is comprised of emails, documents, and other file types, and is saved to computers, mobile devices, the cloud, everywhere. So how do you go about securing your most important electronically stored information (ESI), mitigating risk, controlling costs, and reducing data loss if you don’t know what data you have and where it is? With data growing exponentially and increasing demands being placed on how to regain control of this data, information governance is transforming the way we do business. The default strategy of “let’s keep everything” has led to soaring storage costs, high legal costs in lawsuits, a heavy burden on IT for eDiscovery requests, and increased risk that sensitive data will get lost in the data chaos. Join guest speaker Heidi Shey, Senior Analyst with Forrester Research, and Libby Robinson, Product Marketing Manager at TITUS on this webcast and learn how data classification helps give data an identity, allowing organizations to determine how to handle and secure their most sensitive information. Learn how Symantec DLP Network Discover leverages TITUS classification metadata to find sensitive documents in inappropriate locations. The EU General Data Protection Regulation (GDPR) will have an impact both in the EU and around the world. Organizations that act now and have a clear data protection plan will have a competitive edge helping them to build trusted customer relationships and drive business growth. Learn how to apply TITUS classification metadata via integration with Symantec DLP FlexResponse. This video shows automatic classification as well as administrator-applied classification within Symantec DLP. 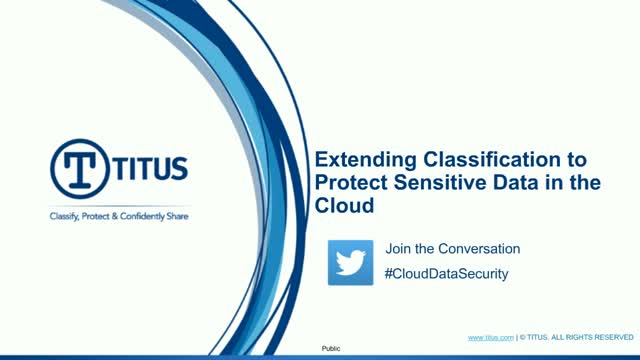 Discover how TITUS Classification Suite and Symantec DLP work together to identify and protect sensitive information. Discover how to mark and safeguard Controlled Unclassified Information (CUI) for compliance with Executive Order 13556 and NIST Special Publication 800-171. TITUS solutions enable organizations to discover, classify, protect and confidently share information, and meet regulatory compliance requirements by identifying and securing unstructured data. TITUS products enhance data loss prevention by classifying and protecting sensitive information in emails, documents and other file types – on the desktop, on mobile devices, and in the Cloud. TITUS solutions are trusted by millions of users in over 120 countries around the world. Our customers include Dell, Provident Bank, Dow Corning, Safran Morpho, United States Air Force, NATO, Pratt and Whitney, Canadian Department of National Defence, Australian Department of Defence, and the U.S. Department of Veterans Affairs. For more information, visit www.titus.com.